There's got to be more to this story. 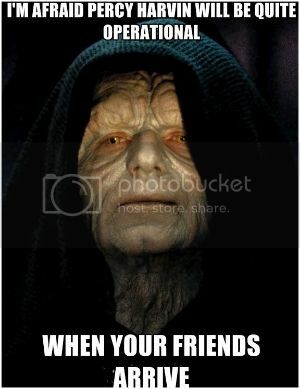 Figured we could use an open thread. I'm guessing he mouthed off to a coach or teammate. Why else would they jettison him so soon after signing him to such a big contract? It's not like they didn't know they were going to have to pay Russell Wilson big bucks when they traded for and then payed Harvin big bucks. Reportedly a single pick in 2nd to 4th round. Seahawks gave up 1st and 3rd round picks for him last year. It makes sense, as a futures move, for the Jets. At 1-6 they won't make the playoffs, but they add a playmaker cheaply. For Seattle, it makes me curious. On one hand, Harvin has not played much for them. On the other hand, when he plays, he is dymanic. The used a 1 to get him, and have paid him 18mil or so. In return, they get a conditional 2 to 4. I recall when the Vikings traded him to Seattle I was equally shocked, because for them, Harvin had also been injured but very dynamic when on the field. I'm wondering if there's something about Harvin that makes him wear out welcomes. Or almost first I typed to much! I thought it was a 1, a 3 and a 7. He had to do something that made the Seahawks want/need to get rid of him immediately and also drag his trade value way down but probably not bad enough to get arrested or kicked out of the league. Fact or Crap: John Idzik really, really REALLY wants to fire Rex Ryan. Think about last night. Geno showed mobility, escapability - in short, if, on all those broken plays, Geno had a Percy Harvin, wild card type player, last night's game ends differently. Fact or Crap: Rex Ryan will be announced as the new Head Coach of the Oakland Raiders before Valentine's Day. I can only figure that there's some suspension or off the field issue soon to come to light. First Baldwin goes off on the team for being too full of themselves and now this. Is it time to start the 24 hour media cycle on how Pete Carroll has lost the locker room and is on his way out of Seattle? I have to call this one like I see it: this is wishful thinking on the part of a Niners fan. I forgot to use the sarcasm font. This is the case of a typical football player that his baggage exceeds his value. 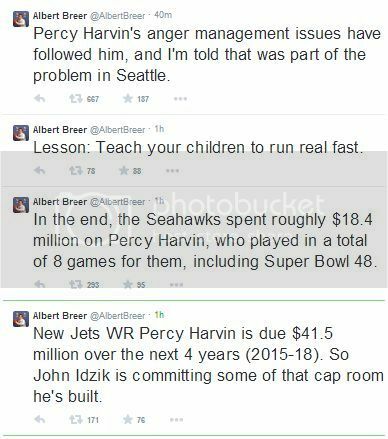 Personally, I don't think Percy Harvin is all of that anyway and I'm probably on the opposite end of most people in that I would not have traded for him in the first place if I was Seattle. Nor would I have traded for him if I were the Jets. There are reports that Harvin no longer wanted to be there, and that factored in. "Percy Harvin is acting like a child and no longer wants to be here, what's the worst thing we can do to him?" "Get the New York Jets on the phone!!" Just got to Chicago to see this. This has to be one where the team trading the guy away is smiling. Thing is, a backfield using the option correctly with Harvin, Ivory and Smith sounds decently scary. Sadly, the Jets won't figure this out and the migraines for Harvin will return. Couldn't have gotten better from that point on. EDIT: Golden Tate, not Doug Baldwin. 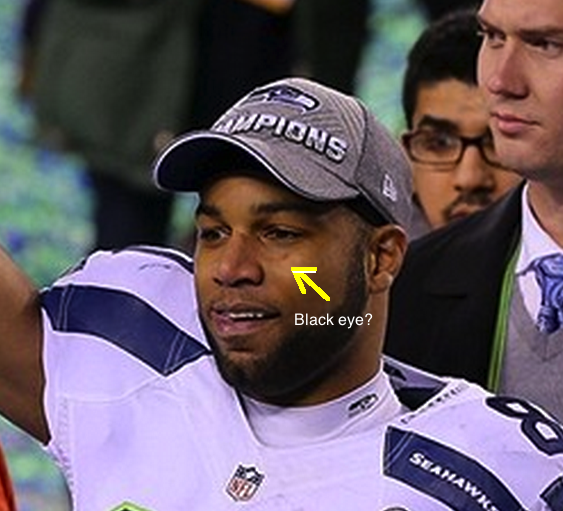 As more of this story has come out, I've been wondering if Tate left because of that altercation at the Super Bowl. Also, I wonder if the 'hawks fleeced Idzik. Reports indicate they were going to cut Harvin, so getting anything for him is a bonus, and now the Jets pay him too. I don't think I've ever seen that sort or punt return fake before. And what a Willie Mayes catch!!! Great stuff. Clearly the Seahawks didn't bother to watch the Niners vs Lambs on Monday. The Lambies were trying to get tricky in that game with a fake punt too but the Niners sniffed it out. With the little chops in full blown kitchen sink mode Seattle special teams should have been on high alert. Clearly Mr. Peanut has lost that locker room. I'd be surprised if he isn't let go at the end of the season.